Tooth replacement is necessary for several reasons, but mainly to provide adequate function and to improve aesthetics. The absence of one or several teeth may also allow overloading of those remaining, so that excessive tooth wear or even tooth fracture may occur. When a tooth is missing, those on either side of it can collapse into the space remaining so that the occlusion is altered, or those in the opposite dental arch can over-erupt into the space and cause unnatural wear of the remaining teeth. 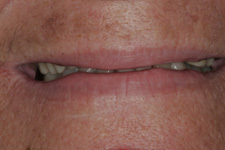 Dentures are removable appliances made in several stages in a laboratory, and designed to replace just one or several teeth, or a full dental arch in a patient. Unlike bridges, no tooth preparation is usually required for their construction as long as denture retention is available, and they can be removed from the patient’s oral cavity for cleaning as necessary. They are retained in the mouth by a film of saliva between the oral soft tissues and the denture surface, which provides suction, as well as by the muscular support of the cheeks, lips and tongue. Ask Dr. Xu about metal-free flexible partials. 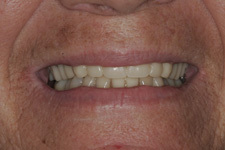 The following are the before and after photos of using complete new set of dentures to enhance the smile and function.